With a critical and unbiased mainstream media, along with a reasonably diligent and fair Federal Police service, Tony Abbott could be in trouble over his recently discovered rorting of the Commonwealth of close to $10,000. Unfortunately, reports managing editor David Donovan, this may be too much to expect in Australia in 2013. 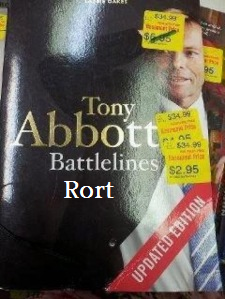 MARGO KINGSTON'S stunning weekend #Battlerorts scoop has finally gone mainstream, with Fairfax Media's Bianca Hall today reporting that Tony Abbott was forced to repay the Commonwealth almost $10,000 in travel expenses he incurred whilst promoting his 2009 book Battlelines. Opposition Leader Tony Abbott had to repay $9400 in travel expenses accrued while he promoted his book Battlelines in 2009, it has been revealed. Mr Abbott made the trips in July and August 2009 - before he became Opposition Leader in November 2009 - to promote his book. The trips included promotions at a Melbourne bookshop and Canberra's National Press Club. The case was revealed on the weekend by former Fairfax journalist Margo Kingston, who published the FOI documents on her website, No Fibs. Abbott has not been referred to the Australian Federal Police for this serious abuse of his entitlements because of what is known as the Minchin Protocol, which enables politicians to pay back the Commonwealth for any breaches of their entitlements without penalty. Despite this, former Speaker Peter Slipper is facing criminal prosecution in Canberra over expenses totalling less than $1,000. Slipper had offered to repay these expenses to the Commonwealth but, as reported by Kingston, the Australian Federal Police declined to allow him to do this because the matter had been referred to them for action. It should be noted that Abbott is the same politician who – with his righthand man Christopher 'Gazelle' Pyne – comically attempted run for the doors of the chamber when he realised Independent MP Craig Thomson was going to vote with his Party on an insignificant motion. Craig Thomson faces charges for amounts totalling around $26,000, dating back to his time with the Health Services Union, well before he became an MP. What might occur were someone to "directly refer" Abbott's questionable expenses to the Australian Federal Police is open to conjecture, especially given the serious questions raised by Kingston herself – and others – about the lack of impartiality and seeming partisanship of this Federal law enforcement body. It is not the only Commonwealth body with questions to answer about partisanship, however; Australia's national public broadcaster, the ABC, under the managing directorship of former Liberal Party staffer Mark Scott, has at time of writing still not reported on this major scandal. Rupert Murdoch's News Ltd has, however, has commented on this matter in passing. For more about this scandal Read Benjamin Thomas Jones' January exposé: If Slipper is guilty — then what about Abbott?